Hitting triple digits won’t be easy, but it’s not as outlandish as it used to be. The average Japanese woman now has a life expectancy of 87, OECD datashow, compared with 81 years for men. And many studies have shown that the wealthy have a built-in longevity advantage. The rich also seem to know that living to 100 is a pricey prospect, one that requires more spending on health care, better food, exercise and other services that can lengthen life. Also, you have to keep paying for everything that comes from hanging around additional decades. In the UBS survey, which focused on people with more than $1 million in investable assets, 91 percent said they’re “making financial changes due to increased life expectancy.” Even the wealthy worry about rising health-care costs, the survey suggests. The rich are more than willing to sacrifice money for extra longevity. Nine of 10 wealthy people agreed that “health is more important than wealth.” Asked by UBS how much of their fortune they’d be willing to give up “to guarantee an extra 10 years of healthy life,” the average responses varied by wealth level. Investors who are barely millionaires, with $1 million to $2 million in net worth, were willing to give up a third of their nest egg for an additional decade of life. Investors with more than $50 million were willing to part with almost half of their fortune. The world’s trend toward longer life has featured an exception in recent years—the U.S. The life expectancy of Americans has declined for two years in a row, an anomaly that can be blamed in part on the country’s opioid abuse crisis. But even before U.S. lifespans started slipping because of drug use, health and longevity statistics significantly lagged those of other wealthy countries in Western Europe and Asia. 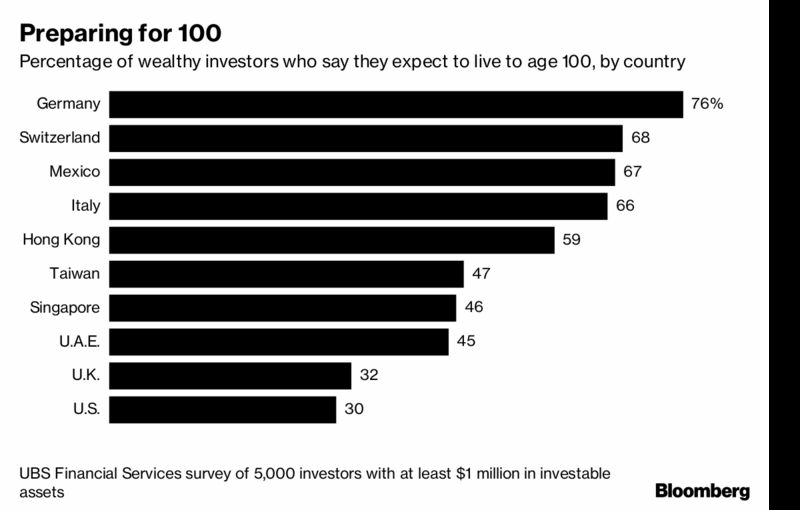 Perhaps it’s not surprising, then, that rich Americans surveyed by UBS had different attitudes from the wealthy elsewhere in the world—they were more pessimistic about making it to age 100. Just 30 percent of the American rich expect to hit the century mark. While they were the most worried about rising health-care costs, they were the least likely to be adjusting their finances for the prospect of living longer.